Saber Diamond Tools is the exclusive U.S. distributor for Rosales Sanding Tools and Brushes! Saber Diamond Tools searched for the ideal manufacturer of sanding tools to complement its diamond tooling and found it in Rosales, of Valencia, Spain. According to Martin Neagu, Saber's international sales manager, the determining factor in Saber's decision to distribute Rosales sanding tools was Rosales' commitment to providing affordable tooling and guaranteed prompt delivery. "The biggest problem with European sanding heads has been cost and delivery - up to six weeks from other dealers. Rosales, however, guarantees ten days delivery from the purchase date. And they haven't missed that even once," Neagu says. 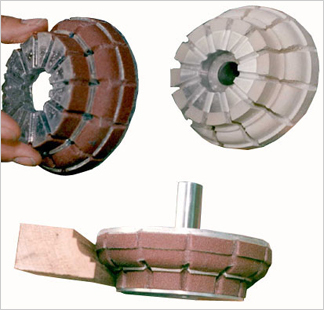 "People are knocking on our door virtually every day looking for this kind of sanding wheel with that kind of delivery and service." Designing the tooling and sanding head profile as a system keeps everyone on the same page, eliminating the possibility of error. Utilizing the drawings created for the diamond tooling, Rosales produces the sanding wheel to the customer's custom specifications. In addition, Rosales offers a standard line of 3,000 profiles, available through Saber. "Rosales' willingness to support any after-sale is impressive," Neagu adds. "We haven't seen a lot of that from European manufacturers because they're so far removed. But Rosales has a good feel for what pricing and delivery demands are in the United States, and they have accommodated very well. There has been a real melding of engineering between our two companies." Founded 20 years ago, Saber has two plants, one in Hilliard, OH, and one in Villa Rica, GA, producing diamond tooling. Always updating its technology to stay ahead of the curve, Saber has discovered that adding Rosales sanding tools to its line has extended the curve. Contact Us Right Now for more details and to order.